On Monday, we thought we'd pick your brains and see how you felt about Amazon's brand new line of affordable tablets. Ranging from 7 to 10 inches, the cheapest of the slates — the 7-inch model — costs just $49.99 in the US, going up to $229.99 for the largest member of the family. As we noted then, that kind of money gets you no more than an entry-level device, with a specs sheet that doesn't exactly read like a science fiction novel. We've got mediocre quad-core system chips, 1 gig of RAM, and fairly low-res displays. In addition, you get Amazon's fork of Android on the software side, called FireOS, which means that you won't be getting access to goodies such as Google's Play Store. Instead, you'll be limited to Amazon's app marketplace, or any other, third-party one that you mange to download. Are you considering any of Amazon's new, dirt-cheap tablets? Amazon did a ton to help usher in the age of lower cost tablets. The problem is that everyone else followed suit and now offers more compelling options at those price points. 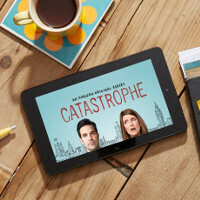 Considering that Fire Tablets are more or less just gateways to Amazon content, they might be better served in taking a hit on the hardware cost in order to make their high end offerings considerably less expensive and offer more bang for the buck. I was considering it, but then I realized the main thing I use my tablet for are this point is Xbox streaming, which this tablet cannot. It's still a pretty good tablet though for those on a budget. *At instead of are. Oh, and I have an hp stream 7. Removing 1gb of memory for the micro sd slow was a bad decision. Could have done both. Bastardized ARM tablets aren't for me, my OnePlus One already does more...need a bigger screen, I'll switch to my Surface Pro. Comes down to productivity for me. While I am not the average joe, anytime my kids are around other kids and we are with their parents the conversation always comes up, oh what tablet is that. Example situation that happened last night. A parent was at my sis with her kid who pulled out a $200 7in Samsung tablet with 8GB of space. Then my kid pulls out their tablet and they start to play minecraft, my kiddos tablet is a HP stream 7. They asked where I got it etc, most likely a conversation starter since I didn't know this parent. When I said I got it for 70bucks and its a full pc, and that my kid uses the desktop office for their school work and etc. Their minds give the look of 'well f, I over paid'. So it comes down to what does that tablet offer me that my 70 Full PC doesn't?